It has been said before that there are no original thoughts. The way to appear original is dependent upon how well you can hide your sources. One of my qualms with the Esper Files series from the beginning has been that it feels very derivative. Right from the get-go, I felt the series was essentially just an X-Men clone set in the steampunk genre. While this was an interesting concept, too much of it was pulled from the popular franchise, making it a bit distracting. In the sequel, Esper Files 2: Sky Cult, a few more references were worked in to help make the characters and story feel a bit more original. I picked up tones of anime like Fairy Tail and One Piece in this story, but I also picked up another blatantly obvious reference: Deadpool. Sure, I get it, he’s a fun character to write; but when his actions feel like the author wrote himself into a corner and couldn’t get out other than to throw in this red herring to distract the reader into thinking there was going to be a logical conclusion. I will applaud Egan Brass for once again writing some very well-thought out characters, the trio of James, Nathan, and Freya being some of the best (aside from the eye-rolling, aforementioned “Red Cap”). The dialogue and banter between his characters really makes them entertaining. All this being said, the plentitude of typos in this book seemed to match the amount found in the original Esper Files. Some of them were pretty simple errors, which were made all the more confusing by the large vocabulary Brass uses to describe this alternate reality London. Clearly, he knows how to write with a lot of words, it’s just that an editor didn’t manage to catch a lot of the wrong ones. 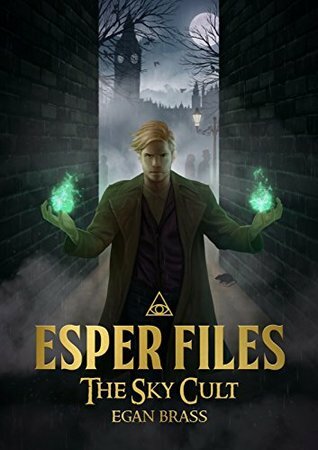 Another exciting story that adds to the Esper Files universe, I give Esper Files 2: Sky Cult 3.5 stars out of 5.